It was founded on 26 November, 1999, and is dedicated to the exploration and celebration of the Pagan culture and civilization created by the ancient Greeks and Italians, which reached its culmination in the Roman Empire. In short its reviving and supporting the polytheistic Pagan religions and cults of the ancient Greek, Roman, Italian, and kindred peoples. It's website can be viewed at http://www.antonineimperium.org/index.html. Currently two persons have formed this micronation, many places (positions) can still be be found vacant, to be filled up by people taking their respective roles and responsibilities. First person is Antoninia's founder Mr. John H. Carlson, who is also acting Head of State and usually identify himself as "Quintus Poppaeus Sabinus". Second person identified in this setup is "Tiberius Claudius Camillus". Antoninia uses the AUC dating system, which counts years from the traditional date, based on the year in which Rome was built. AUC is an abbreviation of Ab Vrbi Conditvm, which means "In the Year of the City". In Latin "AUC", which stands for "ab urbe condite" means "from the founding of the city", 1 AUC corresponds to the year 753 BCE in the common era reckoning. This dating system is also employed by Nova Roma. Year 2005 CE corresponds to 2758 AUC. Antoninia originated as the state of Imperium Novum, or Imperium Romanum Hellenicum, whose Declaration of Sovereignty was announced on November 26, 2752 AUC (1999 CE). Its founder, Quintus Poppaeus Sabinus, “had been inspired by the micronation of Nova Roma”, of which he had been a member (he left it “after becoming dissatisfied with its development and structure". Furthermore, “the design of the Antonine state has since developed in a rather different direction.”). Imperium Novum was formally dissolved on February 10, 2754. It was re-founded on March 21, 2754 (2001), under the name of Antoninia. This organization was again terminated on December 31, 2754, but was reestablished “after much consideration” on April 21, 2755 (2002), with a new Constitution and Laws. “The new state can be developed as an autocracy, as an oligarchy, or as a republic or democracy.” In fact Antoninia is an organization designed in such a way that it can also easily adopted to become an independent and sovereign state. Accordingly to its defined Constitution, Antoninia is an independent, sovereign, self ruling entity. It “is intended to be an empire of culture and spirit, of art and piety, without any fixed physical boundaries.” Currently Antoninia does not possess any sovereign physical territory but this does not mean that the New Empire may not someday possess territory of its own. Accordingly to Declaration of Sovereignty on Imperial Decree of January 16, 2757 AUC (2004 ce), "The Roman Hellenic Imperium of Antoninia may claim, at a location yet to be determined, physical territory that shall be recognized as sovereign and independent by other independent national states. Antoninia may also possess property and territory within the boundaries of other national states, which shall be subject to the laws of those states". “The Antonine Imperium is still a theoretical exercise rather than a practical reality at this point, but the Founder intends to continue the project". 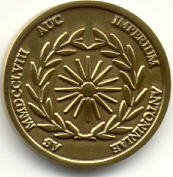 Their first coin, a 1 As piece, dated 2758 (2005); was obtained from Mr. Oded Paz. It was minted on an antiqued bronze metal by Quality Challenge Coins, designed by Mr. John H. Carlson, having a total mintage of 1500 coins, 28.6mm in diameter with plain edge. 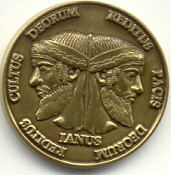 There are also a few error type coin which displays a distinct flattening and loss of detail in the the Janus figure's wreath-like headband, above each forehead. The Denarius is the Imperium's basic currency unit, and the other fifteen units of currency that it has created by decree have values relative to it. The As, for example, is worth 0.625 of a Denarius, while 10.80 Denarii = 1 Dodekadrachm.